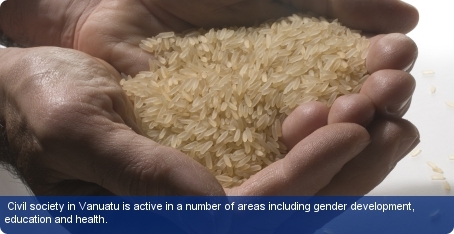 Civil society in Vanuatu is active in a number of areas including gender development, education and health. Vanuatu’s National Council for Women, a leading voice in civil society, is working with government in research, policy and professional development and in many other programmes on gender equity. Another prominent NGO, the Foundation for the Peoples of the South Pacific Vanuatu is focusing on sustainable development, particularly in health, youth, good governance, small business and community capacity building. The World Wide Fund for Nature (WWF) ‘Forests for Life’ programme is a prominent international NGO which works to preserve Vanuatu’s rainforests and species that inhabit them. The Vanuatu Association of NGO (VANGO) facilitates the action of NGOs in the country. There is a no designated NGO register. Each NGO is required to comply with particular legal structure that it subscribes to. For example, the operations of an NGO that registers as a charity will fall within the confines of the Charitable Associations (Incorporation) Act [Cap 140] and those for a company limited by guarantee should fall within the Vanuatu Companies Act [Cap 191]. The umbrella organisation for trade unions is the Vanuatu Council of Trade Unions (VCTU) and accommodates the country’s two existing trade unions: the Vanuatu Teacher’s Union and the Vanuatu National Worker’s Union.